A rare and large celadon jade water buffalo. Late Ming / early Qing dynasty. 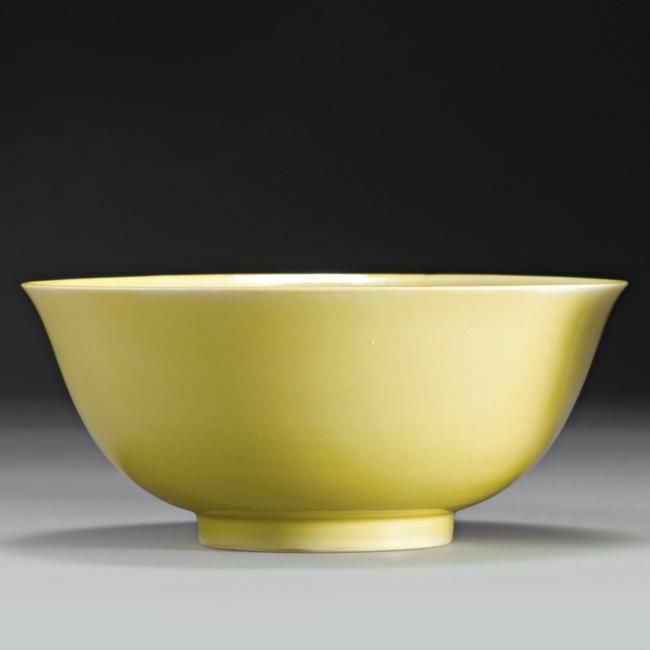 PROVENANCE: The Henry and Sula Walton Collection of Asian Ceramics and Works of Art. NOTE: The present piece is notable for its sensitive rendering, with the rich textured russet tones of the stone reminiscent of the animal's coat of fur and the darker inclusions drawing attention to its delicate facial features. The distinctly colored and veined choice of material for this and similar buffaloes might fit best with a late Ming (1368-1644) date, while the strength, elegance and simplicity of the carving are in tune with stylistic principles of the Kangxi reign (1662-1722). Comparable jade buffalo figures of this size are known from several fabled collections of the past, many of which are said to have come from the Yuanmingyuan (Summer Palace) in Beijing. A recumbent black and grey jade example from the collection of Somerset de Chair and the Mrs. Parsons Collection, was sold in our London rooms, 18th July 1952, lot 50, and again, 9th June 2004, lot 151. 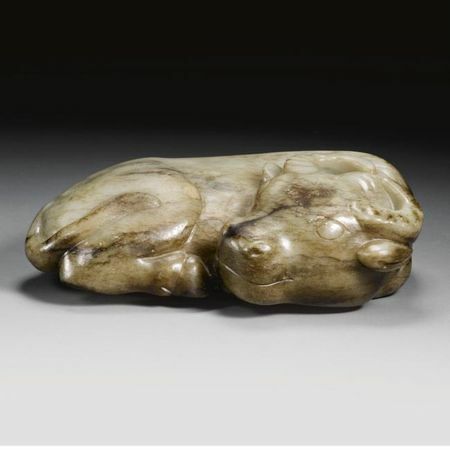 Further examples of this rare group include the Jacob Goldschmidt buffalo, included in the exhibition Ausstellung Chinesischer Kunst, Berlin, 1929, cat. no. 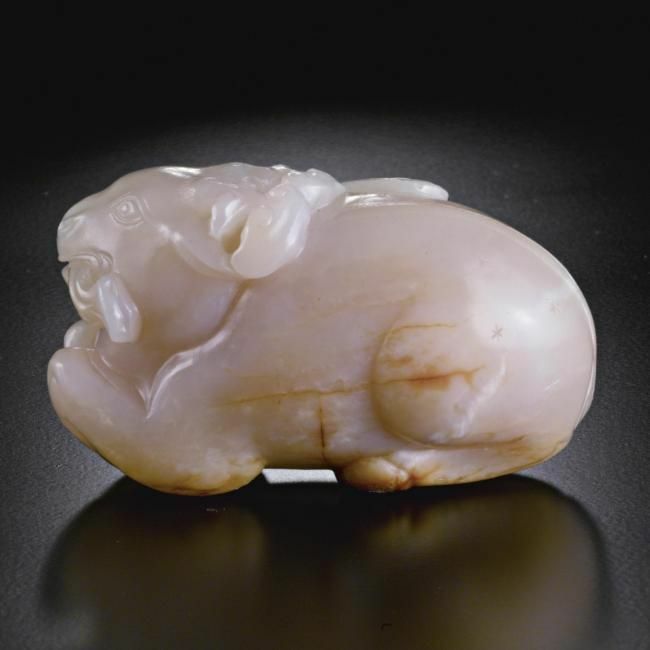 1085; and the Oscar Raphael buffalo, now in the Fitzwilliam Museum, Cambridge, included in the Oriental Ceramic Society exhibition Chinese Jade Throughout the Ages, Victoria and Albert Museum, London, 1975, cat. no. 395. 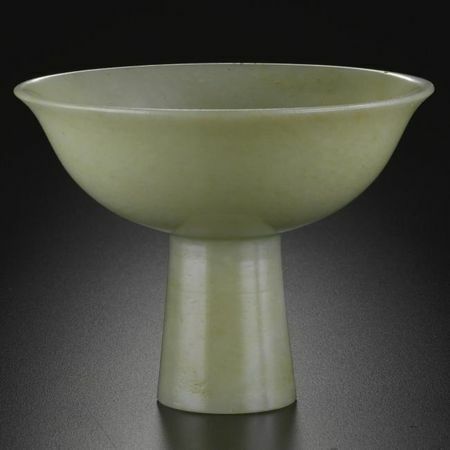 NOTE: Jade stembowls were often made after early Ming, Yongle period, ceramic prototypes. 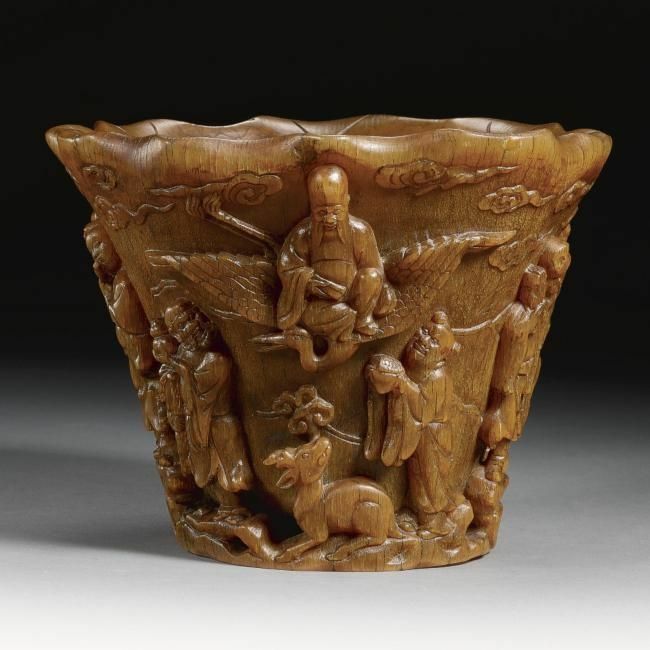 Compare, for instance, an example in the British Museum, London, published in Jessica Harrison-Hall, Ming Ceramics in the British Museum, London, 2001, pl. 3:1. A jade stembowl of similar shape from the Malcolm Collection, sold in our London rooms, 29th March 1977, lot 37, which was included in the Internation Exhibition of Chinese Art, London, 1935-1936, Cat.no. 2823, also illustrated in S.C. Nott, Chinese Jade throughout the Ages, London, 1937 , pl. XXXII left; another example also sold in our London rooms, 14th December 1982, lot 47. 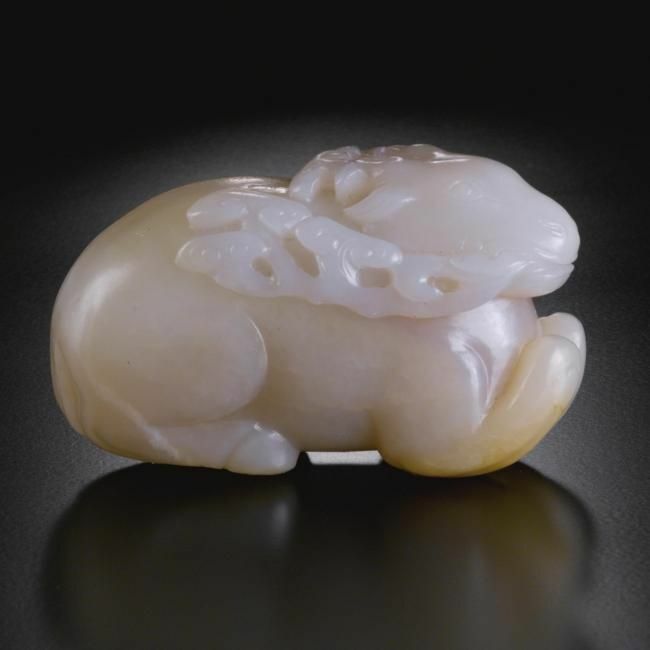 A fine small white jade carving of a deer. Ming dynasty, 16th / 17th century. EXHIBITED: Christie's New York, 13th-26th March 2001. Museum of Fine Arts, Boston, August 2003 - December 2004. 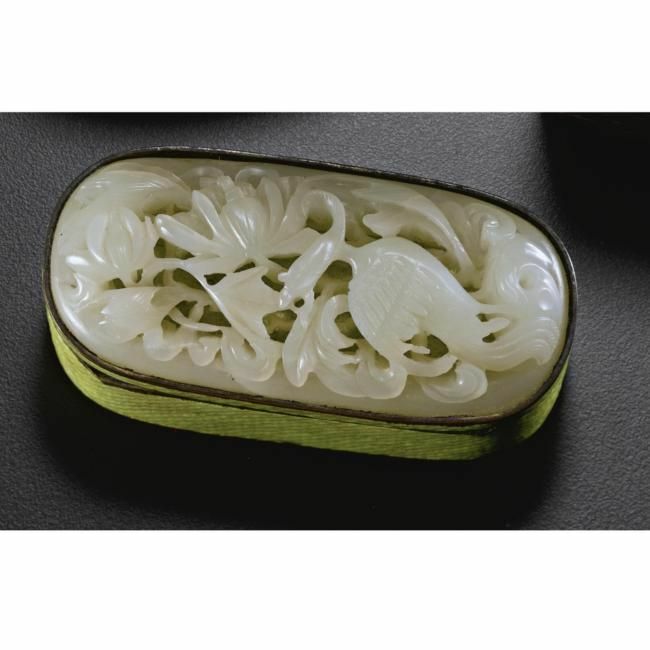 LITERATURE AND REFERENCES: Robert Kleiner, Chinese Jades from the Collection of Alan and Simone Hartman, Hong Kong, 1996, no. 62. A jade bell. Late Ming dynasty, 17th century. PROVENANCE: the bell: Mrs. Christian Holmes Collection No. 1068 (according to label). 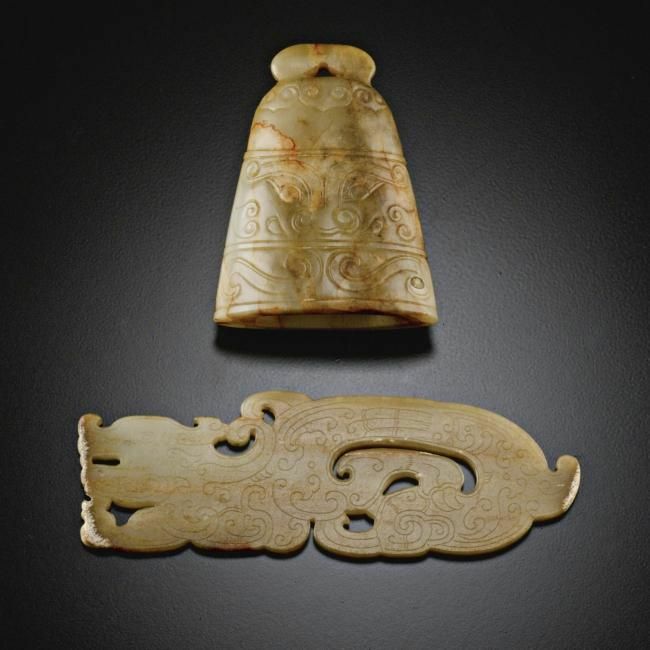 A reticulated jade plaque. Yuan / early Ming dynasty.